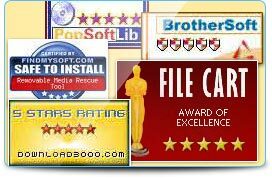 ♦ Best Removable media data recovery software has received BrotherSoft award with 5 stars for accurate and excellent working process from Freeware and Shareware download centre brothersoft.com. ♦ Appreciated and awarded with 5 stars by best online software library DownloadJunction.com for high achievements in data recovery process. ♦ Removable media data recovery software is safe and easy to install and has received 5 Stars from Shareware, Trial-ware website Findmysoft.com. ♦ Most popular removable media data recovery utility has received 5 stars rating by famous Shareware and Freeware website Download3000.com. ♦ Best purchasing Removable media data recovery software has received Award of excellence from top rated filecart.com for quick and easy file retrieval capability. ♦ Achieve high popularity among users for safe and easy-to-use data retrieval techniques by best download center PopSoftLib.com.